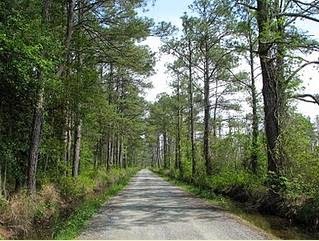 East of Richmond, Virginia, near the small town of Diggs in Matthews county, with the Chesapeake Bay just beyond Haven beach lies a 50 acre section of forest and marshland known as Old House Woods. For years there have been reports of paranormal and ghostly activity in these woods. From the ghosts of British redcoats to the apparitions of pirates dressed in knights armor. Mysterious shovelers can be heard digging in the dark. Ghost horses and cows vanish right before your eyes. There's even been reports of a fully rigged Spanish galleon that vanishes into the night. Ghost lights have been seen moving through the woods and a Storm Woman will sometimes appear, floating above the trees to warn of an impending gale. There have even been rumors of a time warp that lies somewhere within the forest. Some will tell you there's nothing wrong in Old House Woods, that the reports of paranormal activity are the results of an over active imagination. Others have reported an overwhelming sense of dread overcoming them upon entering the woods at night. Of hearing a cow bell when the night is still around them with no wind to stir a wind chime to account for the sound. Of the skeletal ghost of a pirate that will emerge from the sea. Of two headless black dogs that will attack your vehicle if you linger too long. It is rumored that buried treasure, guarded by the ghosts of the dead, lies somewhere within that marshy forest. King Charles II sent a load of treasure to the new world in the event he had to go into exile. The ship carrying the treasure became lost, was attacked by pirates who took the treasure and buried it. It is rumored that Cornwallis had gold and silver buried in a graveyard near White's Creek following the battle of Yorktown. Such a desolate place with a so much history is bound to attract such rumors. If you go there to see for yourself remember the abandoned house is private property so please respect the owners right against trespassing. While you're here don't forget to enter my monthly giveaway. This month I'm giving away a $10.00 Amazon gift card along with an electronic library of all mu published works. The next drawing take place August 15, 2014. Follow the Where's Puddles giveaway link above to enter.